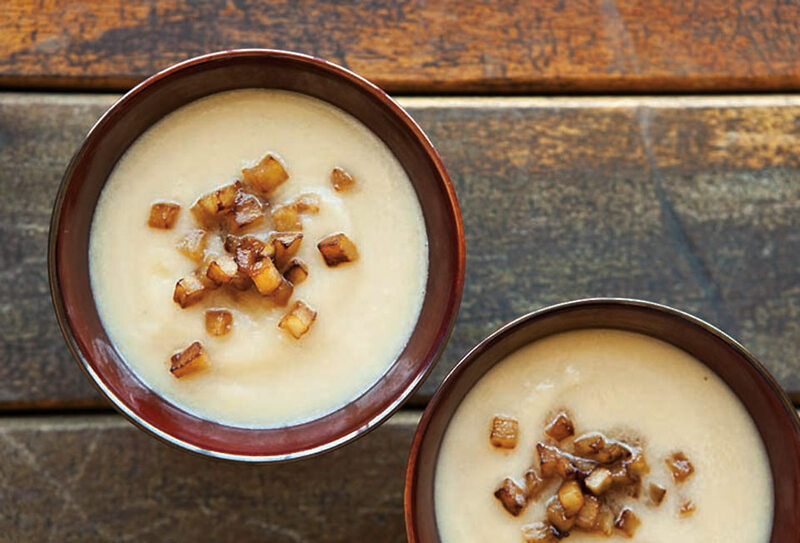 For this celery root soup, caramelized apples top a puree of cooked celery root (aka celeriac), leeks, vegetable stock, and half and half. An excellent autumn dish. 1. In a large, heavy pot over medium-high heat, melt the butter. Add the leeks and sauté until soft, about 4 minutes. 2. Add the celery root, stir to coat, and sauté for 2 minutes. Add the broth and bring to a boil. Reduce the heat to low and simmer, uncovered, until the celery root is very tender, 25 to 30 minutes. Remove the pot from the heat and let cool slightly. 3. Purée the soup with an immersion blender or, working in batches, purée it in a blender and return the soup to the pot. (You can make the soup up until this point and stash it in the fridge for up to several hours or in the freezer for up to several weeks.) 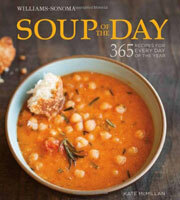 Place the soup over medium heat, add 2 tablespoons of the half-and-half, and bring to a gentle boil. If a thinner soup is desired, add more half-and-half. Season with salt and pepper to taste. 4. While the soup is cooling, melt the butter in a large skillet over medium-high heat until it foams. Add the apples and sauté for 4 minutes. Sprinkle with the brown sugar and stir to combine. Cook, stirring occasionally, until the apples are tender and begin to caramelize, about 3 minutes. Remove from the heat. 5. Ladle the soup into bowls and garnish each portion with some of the caramelized apples. Celery Root Soup with Caramelized Apples Recipe © 2012 Kate McMillan. Photo © 2012 Erin Kunkel. All rights reserved. All recipes and photos used with permission of the publisher. I love this celery root soup! I found the soup to be easy to make and delicate in flavor with a nice sweetness coming from the apples. It’s fast enough to do on a work night for dinner. I think I’d love this soup even if I didn’t make the apple part. Definitely worth doing again. It was a little thick, but a couple tablespoons of 2% milk thinned it out nicely. I didn’t want to use more cream as I thought it might’ve made it a tad too rich. It was still a thick soup but not really pureelike, more like loose applesauce. I love the texture and taste of celery root and was excited to get to work with it for this recipe. Sort of hard to find, but worth the search! I love any recipe that starts with leeks cooking in butter…perhaps one of the best smells ever. I used 32 ounces of vegetable broth here. After I pureed the leek and celery root mixture, it was pretty thick, so I needed more stock to thin it out. This might just be a personal preference on the texture. I decided to use a handheld immersion blender instead of a regular blender, so I recommend trying that as well (less clean up!). I really liked the addition of sweet, caramelized apples to this soup. I bet pears would work well, too. I’d like to try this again with a salty garnish—maybe some pancetta or bacon? Or maybe some crisp fried shallots? Roasted hazelnuts? This recipe would also work well with turnips, or rutabagas even. Overall this was a wonderful recipe with a blank canvas for potential toppings! I’d serve this again in a heartbeat—would be great for the holidays as well. This celery root soup was easy to make and I thought the combination of celeriac and caramelized apples was a good one. I found that the half-and-half was inadequate, as most of the stock had been absorbed by the celeriac and so it needed quite a bit more water added when blending the soup. Given these slight issues, I still thought the soup was very tasty and I’d make it again. I particularly liked the caramelized apples and would like to incorporate them into other dishes. One of the best soups I’ve had a in a long time! Pretty tasty.